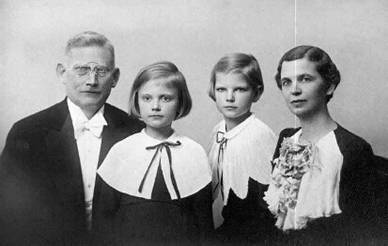 Since Red Terror, genocide and the slave economy, provided for in the economic structure of the Soviet State, are the foundation of the bolshevik regime, it is easy to understand that all these methods were automatically put into effect immediately after the occupation of the Baltic States in June 1940. The incorporation of these countries had not yet taken place when the NKVD started its work, in all three Baltic countries, not only by deporting the State presidents of Latvia and Estonia (the Lithuanian President was the only one who escaped the Soviets), but also the governments and the most prominent of the social workers and politicians of the three countries. After the incorporation, the Order No. 001223 which referred to the registration of "anti-Soviet elements" with the view of subsequently punishing them, and issued by the NKVD as early as October 11, 1939, was revived to its full extent. No sooner was the Soviet Latvian Constitution decreed on August 30, 1940, according to which the Latvian People's Commissariat of State Security was "federal-republican", i.e. common with that of the USSR, than the specialists in the matters of the NKVD, sent from Russia, could under the direction of the NKVD commissar A. Novik (in autumn 1940) and the NKGB commissar S. Shustin (early in 1941) "legally" start their activity. The premises of the former Ministries of Home and Social Affairs, a conspicuous building in the central part of Riga, was turned into the NKVD main headquarters. In November 1940 the ground-floor and cellars of this building were remodelled into a special prison for interrogation, and provided with cells measuring 80x80 cm [31.5 inches square] on plan and called "dog-kennels" (in Russian "sobachniki"), where the prisoners could neither stand nor lie. After all kinds of devilishly subtle methods of torture the prisoners were put into these cells to "recover" until they were again summoned for interrogation which usually began late in the evening and lasted the night through with the purpose of extorting a confession from the prisoner. 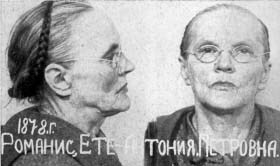 The NKVD had at its command an extensive net of agents whose reports were worked out by specialists. 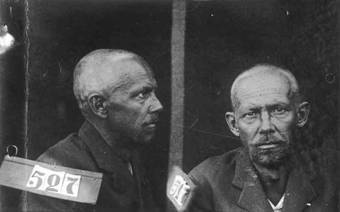 All prisons were under the control of the NKVD which had at its disposal special military units. 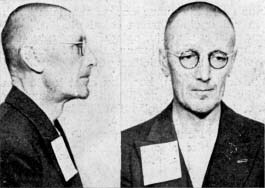 Even the militia, Workers' Guard, the members and candidates of the Bolshevik party, members of the Communist Youth and the rest of the ancillary party organizations had to obey NKVD orders and instructions. 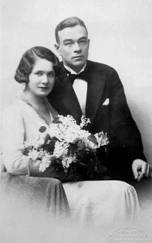 Who, then, were the unfortunate people who sooner or later had to succumb to the NKVD? 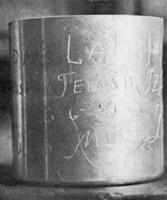 The secret order, signed on November 28, 1940, at Kaunas by the Lithuanian NKVD commissar A. Guzevicius, which was found in the summer of 1941 among the documents left by the NKVD (cf. K. Pelekis, Genocide, p. 265-267, published by Venta, Germany 1949), gave the answer to this question. 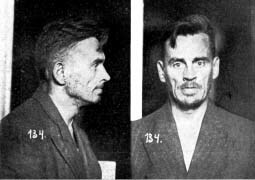 Taking into account that the NKVD in the three Baltic countries only executed the orders which they received from Moscow, there is every reason to assume that confidential orders of a similar content were issued to their subordinate authorities also by the Latvian and Estonian NKVD commissars. a) all former members of anti-Soviet political parties, organizations and groups: Trotskyites, right-wingers, Essers, Mensheviks, Social Democrats, anarchists, etc. b) all former members of nationalistic, chauvinistic anti-Soviet parties, Nationalists, Christian Democrats, the active members of student fraternities, of the National Guard etc. c) former policemen, officers of the criminal and political police and of prisons. d) former army officers and members of military courts. e) persons who are dismissed from the Communist Party and Communist Youth Organization for various offences against the party. g) all citizens of foreign states, representatives of foreign firms, employees of foreign state institutions, former citizens of foreign states, former employees of foreign legations, firms, concessions, and stock companies. h) persons who maintain personal contact or are in correspondence with foreign countries, legations and consulates, with philatelists and esperantists. i) former officials of Ministerial Departments. j) former Red Cross officials. k) clergy of religious communities, Orthodox priests, Roman Catholic priests, sectarians and active members of religious congregations. l) former noblemen, estate owners, merchants, bankers, businessmen, owners of factories and shops, owners of hotels and restaurants. § 6. For the completion of the alphabetic files for all anti-Soviet elements there must be made the most careful use of all sources, among them: reports of agencies, material of special investigations, material of Party and Soviet Organizations, declarations of citizens, testimonies and other, official material must be proved at first in the agential way. § 9. The chief of the 1st Special Branch of the NKVD is under obligation to report to me daily about the progress of this Order." This enumeration is not complete, as is proved by other documents. Thus, in the above Order are only mentioned members of military courts, but after the NKGB was established on February 3, 1941, the latter had lists prepared which included even public prosecutors, inquestors of the specially important trials, members of Courts of Appeal and Supreme Tribunals, district prefects, military commandants of districts, officers of the Intelligence Section of the General Staff, officers of the Frontier Guard Corps, all officers of the former white Armies, prison guards of the ranks, former employees of the Baltic legations abroad, members of the families of the participants of counter-revolutionary nationalist organizations, whose family heads had been sentenced to death or were in hiding from government organs; families of traitors of the homeland who had fled abroad. Let us remember the Order of the Cheka, published on December 25, 1918: "Your first duty is to ask the prisoner what class he belongs to, what were his origin, education and occupation. These questions should decide the fate of the prisoner." 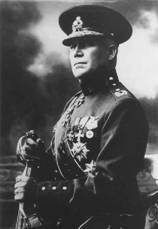 The citizens of the Baltic States at that time naively believed that in the course of the 30 years after the bolshevik subversion in Russia the primary terror and methods of civil warfare had been entirely abolished or, at least adjusted to the principles of right, declared in Stalin's Constitution. Thus, sections 84 and 85 of the Constitution of the LSSR declared that: "In all courts of the LSSR, to the extent that the law does not provide exceptions, cases are tried publicly, ensuring the defendant the right of counsel. Judges are independent and subject only to the law." ... In fact, the Cheka, NKVD-or-NKGB, became the actual ruler of the occupied countries, superior to all other branches of Government, Party and the Red Army. This institution had laws of its own and methods, elaborated during a 30 years' practice which no Constitution of Stalin's ever mentioned anywhere. Thus, for example, in its Order dated April 25, 1941, under No.0023, the Lithuanian NKGB advises all its district branches: "The existence of a large contingent of persons, subject to operative accounting under Order No. 001223 of the NKVD of the USSR, dated October 11, 1939, regardless of concrete data concerning their anti-Soviet activities, obligates the NKGB at the present time to specify separately in its accounting work and screening of the counter-revolutionary and hostile elements, the categories of particularly dangerous persons, whose accounting must be organized in first priority order and within the shortest time possible." 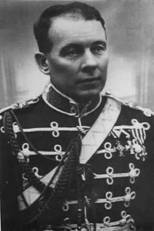 This group of particularly dangerous individuals comprised the leaders of the former political parties of the Baltic States, the chairman of the parliaments, heads of police, commanding officers of the army and the Home Guard and other leading persons who had held administrative key positions during the period of independence and who still enjoyed the loyalty of their adherents and former subordinates. According to the Order No. 001223, these persons had to be eliminated without noise and panic, so as not to permit any demonstrations and other excesses by a certain part of the surrounding population inimically inclined toward the Soviet administration. All arrests took place by night or late in the evening. 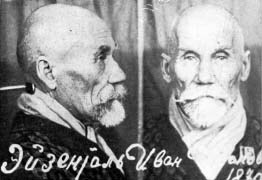 The arrested were removed to the NKVD where they were made to fill in questionnaires, containing innumerable questions, with the view of recording their social origin, education and activity before the occupation. Then followed the interrogation which was combined with psychical [i.e., mental] and physical torture. When, in June 1941, the Red Army retreated from the Baltic area, on the premises of the NKGB were found a variety of instruments which were used for extorting confessions from the prisoners. 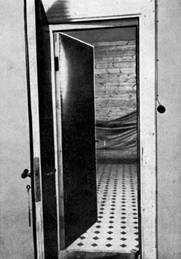 Without enumerating all the devilish devices of torturing, let us mention the ordinary equipment of the working cabinet for interrogation of the NKVD, or NKGB: instruments to break the bones of shins and arms, to squeeze testicles, to pierce the soles of feet and to pull off nails and skin from hands, to squeeze the main nose ligament until the victim bleeds profusely, electrical appliances, etc. The corpses which were left in the courtyards of the NKVD prison and exhumed from mass-graves show that before being shot the "enemies of the people" were mutilated to an extent which in many cases made it quite impossible for relatives to identify the NKVD victims. As a matter of course, the interrogation and sentencing were not carried out publicly, but in great secrecy by special NKGB tribunals. 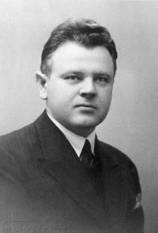 Among the papers of the NKGB, there have survived several lists, bearing the signature of Shustin, Commissar of State Security of the LSSR, on death sentences passed in Riga. These lists usually end with a resolution which reads as follows: "Considering the social danger they represent, all must be shot." On some of these lists, in special columns, the crimes of the condemned have been formulated in a few words, as, for instance: "Did not join singing the Internationale on the 1st of May; has fought in the Latvian Army against the bolsheviks; member of a student fraternity; former policeman; descendant of a kulak; awarded the Order of Lacplesis (Bear-killer); formerly adjutant of the State President; exploited man-power other than his own, etc." 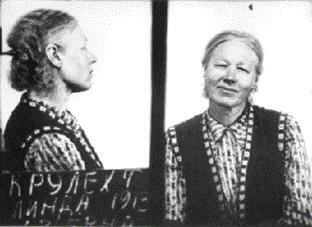 The registration, carried out by the Latvian Red Cross in the summer of 1942, evinced that during the first Russian occupation of Latvia no less than 7,161 political criminals were in prison, amongst them 404 women and 17 children and 179 old people over 60 years of age. Actually, the number of prisoners was by far larger, because many prisoners were reported as missing. 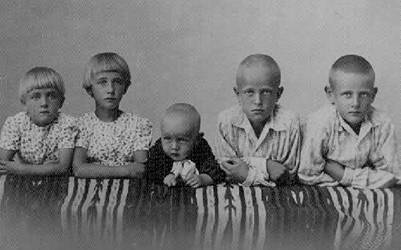 Of these prisoners 979 were killed, the rest sentenced and deported to forced labour camps in Russia. The deportation of smaller groups began as early as towards the end of 1940, while the first larger transport of prisoners left for the autonomous republic of Komi on April 25, 1941. Others followed until June 24, with different polar regions as destination. 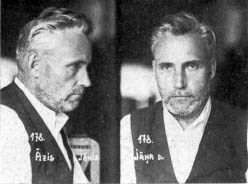 During the whole period of Latvia's independence the total number of political prisoners did not exceed 300 to 400 and of these, as a matter of course, no one was ever sentenced to death, capital punishment being abolished in Latvia. The large deportation scheme, carried out in all three Baltic countries on the night from June 13 to June 14, 1941, had a purely administrative character and had been carefully prepared during the whole previous year according to Serov's Order No. 001223 already mentioned before. This measure was conceived not for the liquidation of individual leading persons, but with the view of exterminating a whole class, the so-called "bourgeoisie". Several days before it was implemented, all available lorries were mobilized and ordered to wait at the police, NKVD and party offices. Before this scheme was put into effect the drivers, among themselves, had already been hinting that a "hunt for the bourgeois" was under preparation. 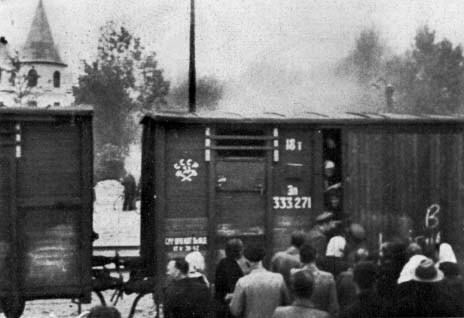 These lorries, manned with armed chekists, militia-men and members of the Communist party who were provided with special lists approved in Moscow, raided, in the dead of night, town flats and country farms, carrying out domiciliary searches, reading their warrants of deportation and telling the people to be ready for departure in an hour's time or even less. According to the instructions, the deportees from the towns were allowed to take with them their belongings not exceeding 100 kg in weight (all personal cash, a whole family's food ration for a month, cooking appliances, footwear, clothes and linen). In the country, people could also take some working tools (axes, saws) with them. If, during the search, arms, foreign currency or counter-revolutionary literature were found, a report was drawn up. 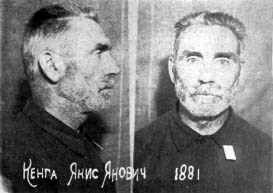 Persons to be arrested who offered armed resistance, were separated from the rest and handed over to the NKVD. After these formalities were settled the arrested families were taken to railway stations where trains, composed of goods-vans with grated window-openings and - as the only convenience - a hole sawn in the floor of the van, were already waiting. While preparing for departure, the families of the deportees were made to believe that they would be all sent together to one place. However, this was a cunning trick, because Order No. 001223 provided that "In view of the fact that a large number of deportees must be arrested and distributed in special camps and that their families must proceed to special settlements in distant regions, it is essential that the operation of removal of both the members of the deportee's family and its head shall be carried out simultaneously, without notifying them of the separation confronting them. . . The convoy of the entire family to the station shall be effected in one vehicle and only at the station of departure shall the head of the family be placed separately from his family in a car specially intended for heads of families." 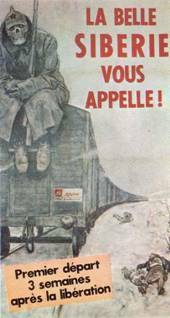 These trains were escorted by a NKVD officer, specially appointed for this task, and by a military convoy. Since the deportation took place in the hottest season, deportees in the crammed wagons suffered horribly from thirst and diseases caused by the unsanitary conditions on the trains.